By January 2019 this page had grown to 300 photos and diagrams. It had become much too large (ca. 42 MB download size), which caused long download times for some users. I decided to make a separate page for each Bernhard station. Please use the (unchanged) list above and update your bookmarks. The general introduction and discussion remains on this page. The FuSAn 724/725 "Bernhard" system is the ground-station ("Stellung", "Anlage") of the "Bernhard/Bernhardine" radio-navigation system, used by the Luftwaffe in WW2, primarily for nightfighters. The beacon-station comprises a large rotating antenna system (ca. 25 x 35 meter). The FuG 120 "Bernhardine" is the associated Hellschreiber-printer and control electronics that were used in the aircraft. It printed the antenna-azimuth data transmitted by a "Bernhard" station. Obviously, the stations were installed on a high point in the area, typically a hill top. Each Bernhard ground station ("Stellung") had a "Be" identifier number. The initial intent was to provide fighter aircraft with radio-navigation coverage throughout France (per page 1 of ref. 179) and along the North Sea coast to northwestern Germany. 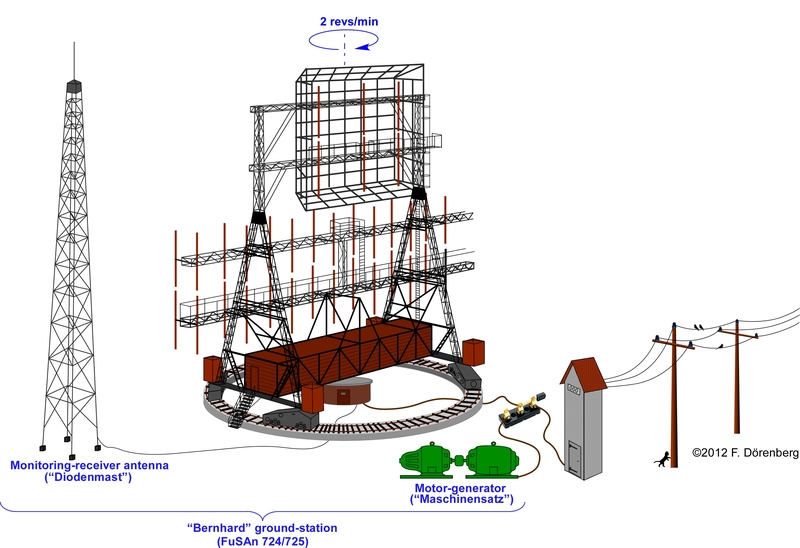 Overall, ground stations were constructed between late-1941 and the end of the war (ref. 2, 74, 96, 177, 179). 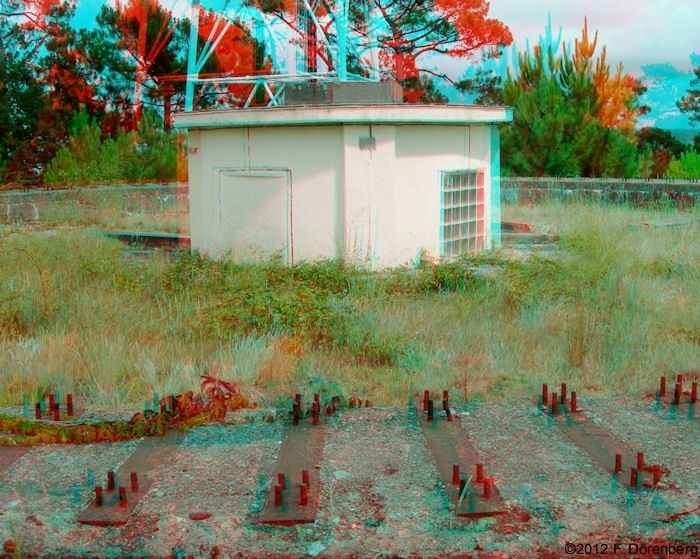 The Telefunken prototype and test station Be-0 was located near Berlin. This makes sense, as Berlin was the capital of Germany, seat of the Reichsluftfahrtministerium (the German Air Ministry), there were Luftwaffe research establishments and test-sites in the area, as well as the companies instrumental in radio-navigation systems (Telefunken, Lorenz,...). Construction of seven Be-stations in France (Be-1 through Be-7) and one in The Netherlands (Be-8) was to be completed by fall of 1944. Per ref. 98, five stations in France were completed by September of 1944: Be-1, Be-2, Be-4, Be-6, Be-7. Clearly, the choice of station locations was driven by perceived (future) air-defence needs. The initial series Be-1 through Be-8 is similar to the section nearest Britain of the "Atlantic Wall" coastal defence line: some 12000 bunkers and other constructions, against a British/Allied invasion across the sea. During the spring of 1944, planning started to extend the coverage to the entire German Reich. The construction was ordered of stations in the far north of Germany (Be-9), Denmark (Be-10), southeastern Poland (Be-11), and western Czechoslovakia (Be-12). Though installation of the antenna system of Be-12 was completed (ref. 177A), it is unclear if the station was ever operational. 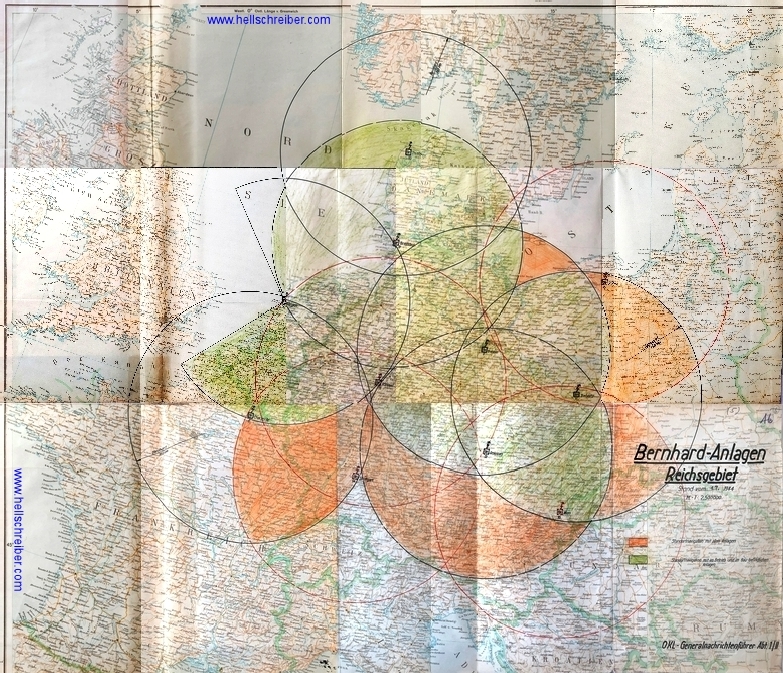 I was able to confirm the location of most Be-numbers with the aid of WW2 charts of the Luftwaffe Radio Corps (Luftnachrichten) and charts for night-fighter navigation (Nachtjagdnavigation). But it was not until several years later, in April of 2017, that I could finally compile the complete and consistent list. This was based on billing information from the company that built and installed the antenna systems ("Hein, Lehmann & Co.", ref. 177A/B/C), and 1944 presentation notes to the General-Nachrichtenführer (ref. 179). 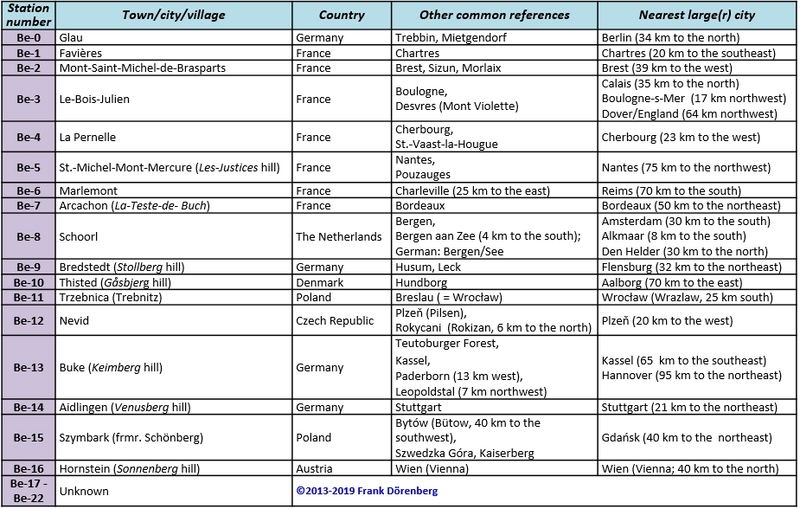 The table below list all known stations. Special thanks goes to Gérard Chatry, for helping me precisely locate some of the stations and gather information on a number of them. A file with station coordinates (both in decimal degrees and degrees-minutes-seconds) is provided as ref. 222. According to ref. 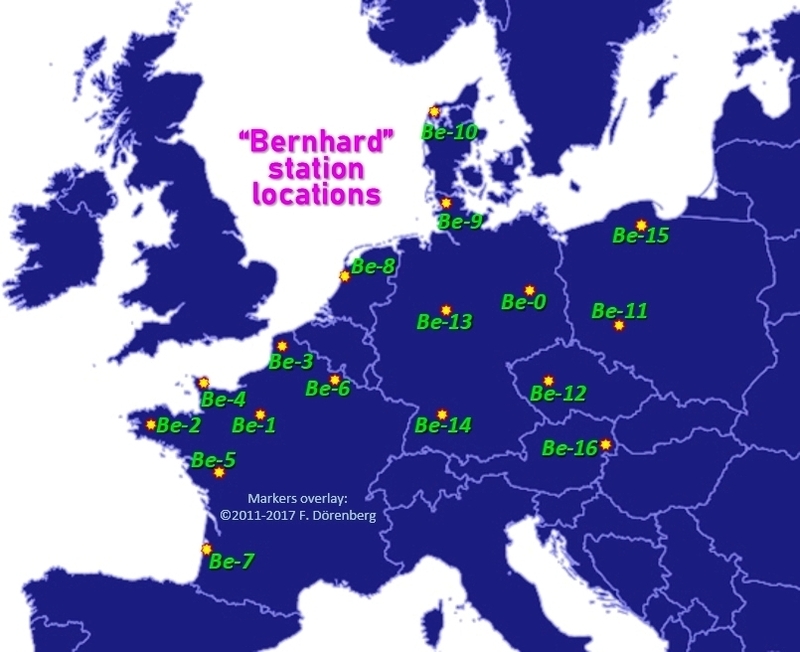 8, only three stations were still operational at the end of the war: Trebbin, Bredstedt, and Thisted; the last two were the only Be-stations that ever had text-messaging capability - a unique feature of the Bernhard/Bernhardine system! Below is an interactive map with the same station locations. In practically all cases, you can fully zoom-in the satellite image map, and see the actual the remains of the station structures. Click on any marker icon, to get the associated information. You can click-and-drag the map with your mouse, and zoom in & out with your mouse-wheel (or use the buttons in the bottom left-hand corner of the map). the German Atlantic Wall ("Atlantikwall") of coastal defences; it ran from the top of Norway, all the way down to Spain. Air Defence Zone West ("Luftverteidingszone West", LVZ). It was supposed to be fully implemented in 1942, but was never completed. Establishment of Zone "East" was not ordered until weeks before the end of the war (ref. 132C). Night-fighter defence line. It was referred to as the "Kammhuber Line" by the British and US intelligence services. 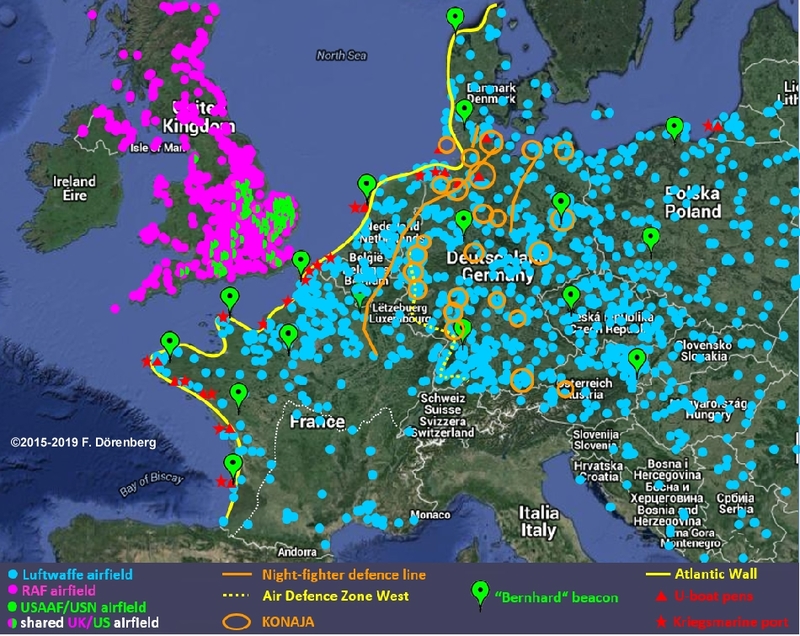 Combined Night-fighter areas ("kombinierte Nachtjagd" (KONAJA) Räume). HENAJA ("Helle Nachtjagd") was another night-fighter control method. Enemy bombers were captured & tracked with radar, and illuminated with radar-controlled search lights. Fighter aircraft were then guided by fighter control, to intercept the bomber. Ref. 132G. In the KONAJA system, the HENAJA system was combined with local anti-aircraft gun sites (Flugzeugabwehrkanone, "FLAK"). On maps of the Luftnachrichten Signal Corps, radio-navigation ground-stations are marked with a square box that has a lightning bolt emanating from the top. The bolt indicates that it is a transmitter. The type of navigation system is indicated by one or two letters inside the box. For several beacon types, the station number is marked below the square box. The "Bernhard" beacons are marked with the letters "Be". 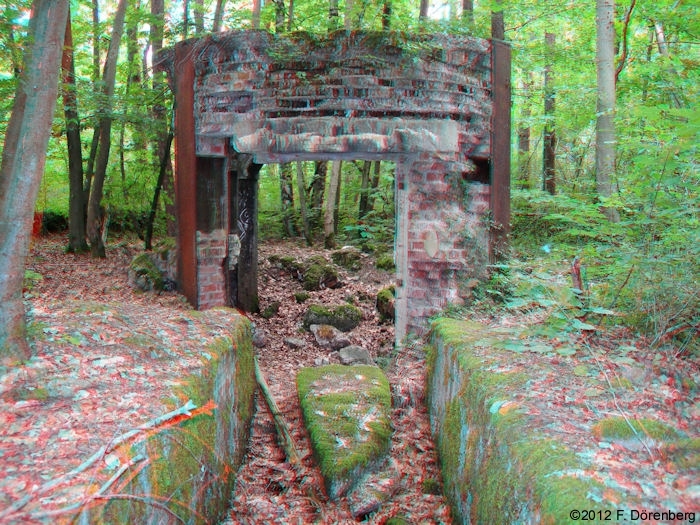 The next sections show many photos (some in 3D) of the various Bernhard sites. I have personally visited the remains of the stations at St.-Michel-Mont-Mercure/Pouzauges (France, 2011), Venusberg/Aidlingen (Germany, 2012), Teste-de-Buch/Archachon (France, 2012),and Buke (Germany, 2015). 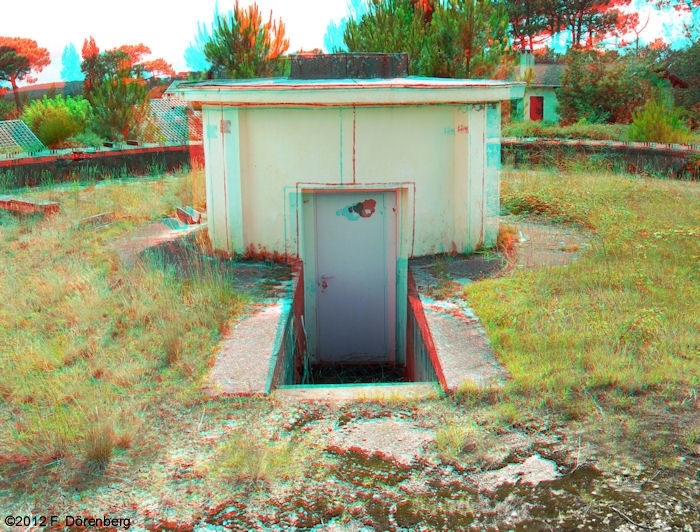 You will need a pair of red+green glasses to view these images in 3D! 3D photos below have not been made with my Stereo Realist stereoscopic camera, but by sequentially taking two pictures with my digital snapshot camera (laterally displaced ≈ 6.3 cm (2½") between the left & right shot). 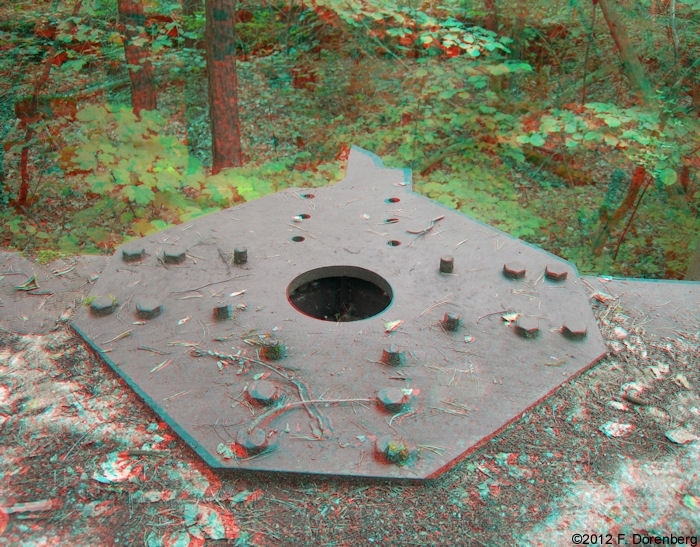 I have converted the stereo-pair photos into red/green anaglyphic 3D images, with StereoMaker (freeware). 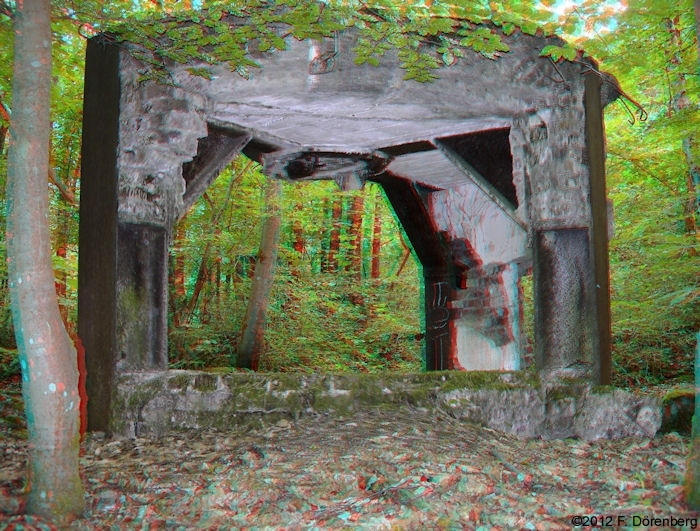 I have made hundreds of stereoscopic photos over the years. 3D photos that I made of my Hellschreiber machines and German WWII equipment are on this page. 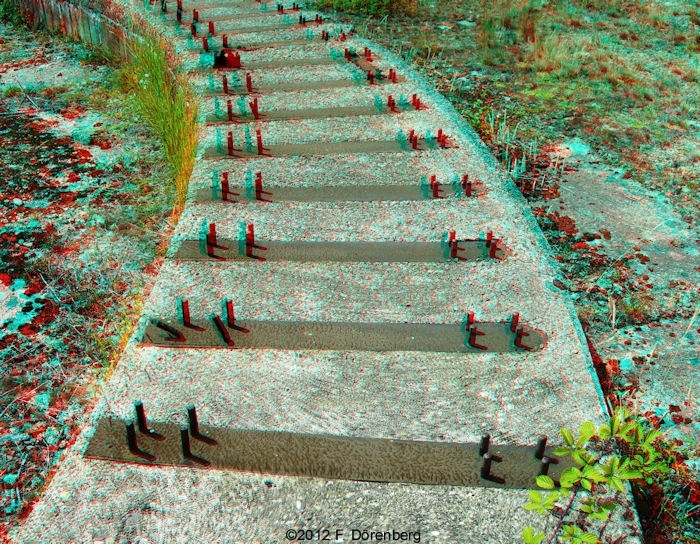 A selection of my 3D photos of other subjects (airplanes, animals, ...) is on this page. What is the function of the three slots in the concrete sidewall of the round building at La Pernelle? What is the identifier letter "Kennbuchstabe" (callsign) of all stations? At La Pernelle, even in 1946, the four "doghouses" were still not removed/dismantled. Too hard to dismantle, or no usable material? What is the purpose of the round holes on the inside of the concrete ring at Trzebnica/Trebnitz, and in the outside of the base of the the concrete ring at Szymbark? What is the purpose of the several several small I-beams embedded into the concrete between some of the rail ties in the concrete ring at Arcachon? If you have any additional information, please contact me! Ref. 2: pp. 76-110, 224 in "Die deutschen Funkführungsverfahren bis 1945", Fritz Trenkle, Alfred Hütig Verlag, 1987, ISBN 3778516477, 216 pp. Ref. 3: pp. 94-102 in "Die deutschen Funk-Navigation und Funk-Führungsverfahren bis 1945", Fritz Trenkle, Motorbuch Verlag, 1995, 208 pp., ISBN-10: 3879436150. Ref. 5: pp. 236-237 in "Instruments of Darkness: The History of Electronic Warfare, 1939-1945", new ed., Alfred Price, Greenhill Books, 2005, 272 pp., ISBN-10: 1853676160; original edition: William Kimber and Co., Ltd, 1967. Ref. 24: p. 200-204 in "Rotating beacons", Section 4.12 of "Radio Aids to Civil Navigation", Reginald Frederick Hansford (ed. ), Heywood & Co. Ltd., 1960, 623 pp. Ref. 74: "Blind landing and airborne communications equipment. Radio and Radar Equipment in the Luftwaffe - II", S.D. Felkin, Air Ministry Directorate of Intelligence, London/UK, A.D.I. (K) report no. 343/1945, July 1945, 6 pp. supplement: "Stations radar et de radio-navigation sur le Mur de l'Atlantique (complement photos)", 32 pp. Ref. 90C: p. 161 in "Stations radar et radio-navigation sur le Mur de l'Atlantique - Volume 2 -Spécial Belgique - Nord - Pas-de-Calais - Picardie - Haute-Normandie", Alain Chazette, Bernard Paich, Pierre Nowak, Alain Destouches, Jacques Tomine, Ingrid Paindavoine, Histoire & Fortifications, 2016, 160 pp. Ref. 97: Bild 16 in "Deutsche Funkmeßtechnik 1944: ein Vortrag von Leo Brandt, gehalten am 8. Februar 1944, zur Einführung der Zentimeter-Technik für das Funkmeßgebiet", Leo Brandt, Vol. 7 of "Bücherei der Funkortung", Sonderheft [special issue], Verkehrs- und Wirtschafts-Verlag, 1956, 29 pp. Ref. 101: manuscript notes of Fritz Trenkle for "Verzeichnis deutscher Bordfunkgeräte aller Art (einschl. der mit FuG-Nr. belegten akustischen und UR-Geräte) 1935-1945" and "Entwurf zu Funkgeräte Katalog Deutschland 1908-1918 und 1919-1945"
Ref. 103: "Aidlingen Venusberg", web-page of Forschungsgruppe Untertage e.V. [pdf] Also part of "Pressebericht Tageswanderung zum Venusberg", Reiner Schopf, p. 28 in "Stadt Holzerlingen Nachrichtenblatt", 1 August 2014. Ref. 106: "La Station de Radioguidage B8 sur le Mont Saint Michel de Braspart (Bretagne - FR)", G. Tomezzoli, Ph. Dupont (used with permission of the author). Ref. 108: "Quatre ans d'occupation pour la vigie du Val-de-Saire : 1940-1944 : La Pernelle, H.K.A.A. 1261, 9 et 10", Yannick Rose, Alençon A.C.R.E.D.I.C. Publ., 2nd. ed., 1990, 68 pp. Ref. 109A: Imperial War Museums (IWM) catalogue number MH 24808: "Low oblique of a 17 cm heavy gun in a hedgerow near la Pernelle. 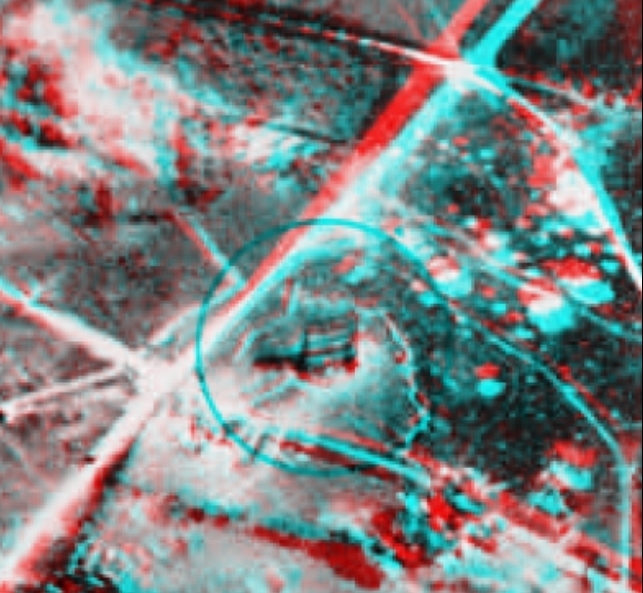 This photograph, taken during a reconnaissance sortie over the 'Bernhard' radio navigational station, led to the discovery of a camouflaged battery at the site"
Ref. 109B: Imperial War Museums (IWM) catalogue number MH 24809: "The gun battery at la Pernelle after air and naval bombardment. The 'Bernhard' antenna of the adjacent radio navigational station can be seen at the road junction, top left." Ref. 109C: Imperial War Museums (IWM) catalogue number MH 24856: "Oblique aerial of the radio navigational station at la Pernelle under air bombardment. 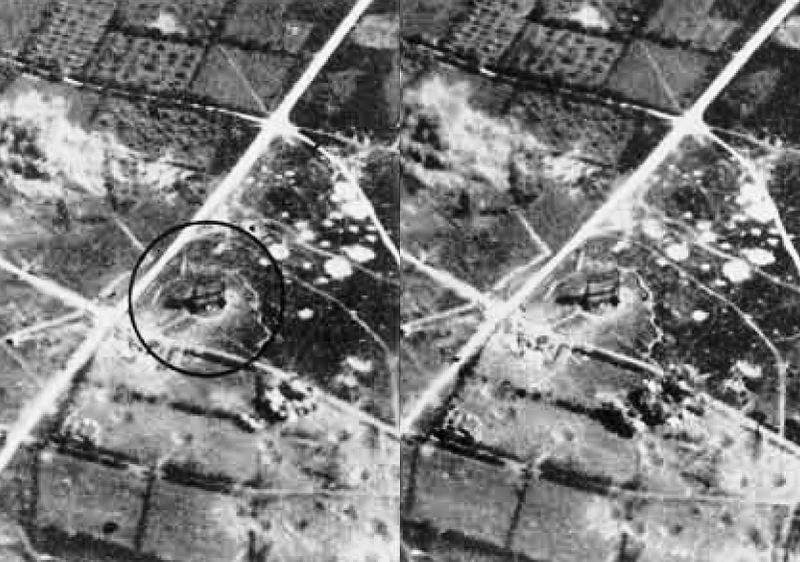 The 'Bernhard' antenna can be seen middle right, and in the right foreground is the destroyed gun battery"
Ref. 113: "Le CSTEI : du radar allemand au satellite…", Centre spécialisé des télécommunications et de l’informatique (CSTEI) de Favières, Dossier de presse M3 Favières, Délégation à l’Information et à la Communication de la Défense (DICoD), 2006, 4 pp. Ref. 115: Drawing of the cross-section of the Bernhard at Hundborg/Gåsebjerg hill, Jens Salmonson, 1982, source: Hundborg Lokalhistoriske Arkiv, used with permission. Ref. 116: personal mail exchanges with L. Sourisseau about eyewittness account, 14-24 October 2013. Ref. 120: personal correspondence with R. Grzywatz, February 2014. Ref. 131: "Exkursion zu Abwehranlage der Luftwaffe", in "Kreiszeitung Böblinger Bote", 31 July 2014. Ref. 132B: "Fliegerhorste - und Einsatzhäfen der Luftwaffe"
Ref. 132F: "Flugplätze der Luftwaffe 1934 - 1945 und was davon übrig blieb - Gesamtverzeichnis", Jürgen Zapf, 2010, 568 pp. Ref. 134: p. 136 in "American Raiders: The Race to Capture the Luftwaffe's Secrets", Wolfgang W. E. Samuel, University Press of Mississippi, 2004, 513 pp. Ref. 165A:"Deckname "Selma" & "Bernhard""; source: website "Geheimes & Unbekanntes Österreich", 2014. Note: website no longer exists (last checked 2018). Ref. 165B:"Deckname "Selma" – UKW-Peiler "Bernhard" - Sonnenberg/Hornstein", Markus Schmitzberger, 2000. [pdf]. Accessed: March 2019. Also published here; Accessed March 2019. Ref. 165C:"Deckname "Selma" - Funkmessstellung Sonnenberg", Markus Schmitzberger, 2000. [pdf]. Accessed: March 2019. Ref. 172: copy of item in file AIR 29/284 "Central Interpretation Unit (CIU) Medmenham; Interpretation reports and aerial photos (1943)". Item is in the collection of The National Archives; material with UK Crown Copyright, used in accordance with the Open Government License [pdf]. Summary of the contents of ref. 172A. Ref. 172A: "German “Windjammer” R.D.F. Stations", part of "Monthly interpretation review for July 1943", 7 pp. Ref. 173: copy of items in file AIR 14/3577 "Signals investigation on 27 to 35 Mc/s "Windjammer" (1943/1944)". Items are in the collection of The National Archives; material with UK Crown Copyright, used in accordance with the Open Government License [pdf]. Summary of the contents of ref. 173A-173E. Ref. 173A: "'Windjammer" observation", by R.A. Fareday (Noise Investigation Bureau [Electronic Intelligence], N.I.B., London), dated 20th June 1944, 1 page. Ref. 173B: ""Possible "Windjammer" transmissions", report by Flight Lieutenant Douglas of 192 Sq., dated 16th December 1943, 1 page. Ref. 173C: "192 Squadron Flight report No. 215/43" by F/Lt Robinson to Squadron Leader Burtler, dated 15th November 1943 (actual report by P/O G.F. Evans of 13th November 1943), 6 pages. Ref. 173D: "Windjammer – Arcachon", letter from Air Ministry A.I.4. [intelligence branch section supervising RAF Y Service] to Commanding Officer of 192 Squadron, dated 16th July 1943, 1 page + 1 aerial photo. Ref. 173E: "The Windjammer and Dreh-Elektra", by 192 Squadron Leader J. Whitehead, dated 18th June 1943, 1 page. Ref. 174: copy of items in file AIR 14/3594 ""Windjammer" station: photographs and interpretation reports. Includes vertical and low oblique aerial photographs of 'Windjammer' radar sites in Germany and France (1943/1944)". Items are in the collection of The National Archives; material with UK Crown Copyright, used in accordance with the Open Government License [pdf]. Summary of the contents of ref. 174A-174J. Ref. 174D: Letter entitled "W/T Desvres/Le Bois Julien" on behalf of Group Captain commanding R.A.F. Station Medmenham to R.V. Jones (A.D.I. Science), dated 15th November 1942, 1 page + 2 photos. Ref. 174E: Letter entitled "W/T: Desvres/Le Bois Julien" on behalf of Group Captain commanding R.A.F. Station Medmenham to R.V. Jones (A.D.I. Science), dated 29th March 1943, 1 page + 1 photo. Ref. 174F: "Interpretation Report No. G. 308" dated 28th June 1942, of aerial photos taken over Desvres/Le-Bois-Julien at altitude of 20k ft during Sortie A/945 on 20th June 1942, 1 page + 1 photo. Ref. 174G: "Interpretation report No. 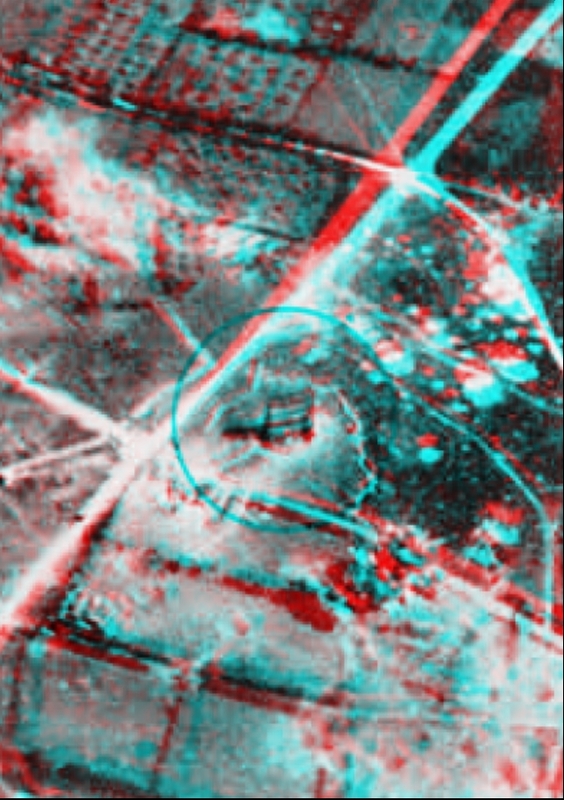 G.590" dated 6th October 1942, of aerial photo taken over locality Morlaix, W/T station Mt. St. Michel, at altitude of 12k ft during Sortie Q/21 on 24th September 1942, 2 pages + 1 photo. Ref. 174H: Letter entitled "W/T: Pouzauges/St.Michel-Mont-Mercure" on behalf of Group Captain commanding R.A.F. Station Medmenham to Squadron Leader Whitehead (A.I.4), dated 29th March 1943, 1 page + 3 photos. Ref. 176A: Letter from Mr. Kurt Pfaender to the HR office of Telefunken in Berlin, with claims; dated 15 November 1950, 1 p.
Ref. 176B: Letter from Mr. Albrecht Leyn (Telefunken/Hannover) to Mr. Gothe (Telefunken/Berlin), recollecting payments of bills & sale of items to Mr. Pfaender; dated 18 September 1951, 2 pp. Ref. 176C: Telefunken memo about conversation with Mr. Pfaender on 20 December 1951, regarding claims of the latter; dated 27 December 1951, 1 p.
Ref. 176D: Letter from Kurt Pfaender to Telefunken in Berlin, describing the course of events; dated 12 January 1952, 2 pp. Ref. 177A: Letter from Hein, Lehmann & Co. to Telefunken with payment status of 17 Telefunken purchase orders and the resulting outstanding significant claim; dated 19 June 1949, 2 pp. Ref. 177B: Letter from Hein, Lehmann & Co. to Telefunken with adjusted claims, based on assessment of Telefunken counter-claims; dated 19 June 1950, 8 pp. Ref. 177C: Letter from Hein, Lehmann & Co. to Telefunken, with further justification for claims regarding delivery & installation of 12 "Bernhard" antenna systems (against purchase order of July 1941) for Be-2 - Be-8 and Be-12, of 6 associated "Dioden-Masten" antenna masts (based on price quote of September 1941), and delivery (without installation) of the antenna systems of Be-1 and Be-9 - Be-11; dated 5 February 1951, 3 pp. Ref. 178B: source of US dollar inflation (CPI, buying power) calculator: www.usinflationcalculator.com. Ref. 178C: Tabulated exchange rate of Reichsmark to US$, with conversion to 2016 US$ and Euro, Frank Dörenberg, 21 May 2017; based on ref. 178A/B. Ref. 179: Draft presentation notes to the General-Nachrichtenführer, dated 3-Sept-1944, covers original plans for geographic coverage (France, German Reich) with Bernhard stations, state of completion of the various stations, status of introduction of the Bernhard/Bernhardine method for nightfighters (Nachtjagd), status of delivery of various types of Bernhardine printers; signed by Hauptmann Franz, 3 pp. ; source: entry on 3-May-2017 in forum thread of www.geschichtsspuren.de. Ref. 180: Layout of the Bernhard installation in Trebbin, based on a sketch from an eyewitness (name and date unknown); source: corporate archives of DTM Berlin, file nr. I.2.060C-07823. Ref. 182: Photo of Mr. Albrecht Leyn and a Luftwaffe Lance Corporal (with SA sports badge), possibly from a FLAK unit, taken in 1942 on the Telefunken test site near Trebbin; source: corporate archives of DTM Berlin, part of file nr. I.2.060C-06172. Ref. 183: "Das Drehfunkfeuer-Verfahren Bernhard und Bernhardine, System Telefunken" ["Verfahrensbeschreibung Bernhard, Bernhardine", description of the Bernhard-Bernhardine method], Adalbert Lohmann, Telefunken Gesellschaft für drahtlose Telegraphie m.b.H., Berlin-Zehlendorf, Telefunken document EC 1 4310, July 1943, 28 pp., copy nr. 11; source: corporate archives of DTM Berlin, file nr. I.2.060C-04403. Ref. 189: "Stückliste zum Kabelplan "Berhard"" [parts list of "Bernhard" wiring diagram], Telefunken document EC1-4237, 6 July 1942, 23 pp. ; source: corporate archives of DTM Berlin, part of file nr. I.2.060C-07553. Ref. 206: Map dated 2 October 1942 in the Kriegstagebuch [KTB, war journal) of the 320th Infantry Division and a 1944 Kriegsmarine KTB. Ref. 210: "Ln. Anlagen (Karten)", Bandnr. 2, Teil 2 of "Anlage B, Teil 2: Ln. Anlagen verschiedener Art, Juni - Aug. 1944"; Bundesarchiv Freiburg, archive file nr. (Signatur) BARch RL 2-V/8, used in accordance with "Erstinformation für Ihren Besuch im Bundesarchiv in Freiburg, Stand Juni 2016"
Ref. 210C: legend page and a page close-up of the folded map "Ln.-Anlagen Westfront, Stand 30. Aug. 1944"
Ref. 210D: several page close-ups of the folded map "Funk-Navigationsanlagen Westraum, Stand 15. Juni 1944", OKL - Generalnachrichtenführer 1. Abt. Ref. 216: pp. 22-23 in "Chronik der alten Guts-Schmiede", Förderverein Alte Guts-Schmiede Blankensee e.V., V3, February 2012, 31 pp. Ref. 219: Map of Luftwaffen- and Marine-stellungen, dated 2-Oct-1942, in the Kriegstagebuch (war journal) of the 320th Infantry Division. Ref. 220: p. 266 in the "Germany" section of "Radio Amateur Call Book Magazine", Spring 1935. Ref. 223: "PSU and generator for Berhardine Hundberg Denmark", US National Archives and Records Administration (NARA), Scan Nr. 9821 111SC 269041; courtesy Mike Dean. Ref. 225: p. 84 in "Luftkrig over Danmark. Bind 3, Jagerkontrol 1943-1945 : Karup 1940-1945" [Air War over Denmark, vol. 3 of 5], Carsten Petersen, Bollerup Boghandel (publ. ), 1950 (first edition; reprinted 1988), 96 pp, ISBN 8789155025. Ref. 226A: personal account by Jørn Junker, date unknown. Ref. 226B: "REGISTRERING THISTED AMT 2. ", description of areas outside Hanstholm, survey performed in 1945 by the 3rd Building District of the Army Building Service, Drawn in December 1945 based on optical measurement, by Poul Boe, Land Inspector. Ref. 227: "The Calibration Mast of WWII German W/T Station Be-2" [pdf], G.T. Tomezzoli, Archaeological Discovery (e-zine), Vol. 7, No. 2, April 2019, pp. 75-83, article. no. 91561. Accessed: 2 April 2019.